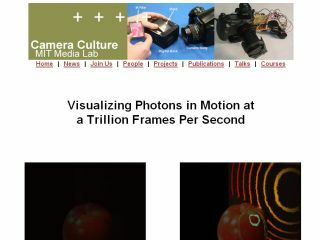 MIT has developed a camera that can record single beams of light travelling through objects at a massive trillion frames per second. The camera has 500 sensors, which are all timed down to picosecond (or one trillonth of a second to you and me) accuracy. Illuminating the subject multiple times with a laser pulse, shoot many hundreds od images each time recording a different area. The images are then stitched together to form one single video file. It is about 40 billion times faster than a UK television camera. Because direct recording of light is impossible, and as the camera is only capable of capturing 1.71 picoseconds of footage at a time, the camera must repeat the process to assemble a complete file. The team behind the camera claimed that the technology could be used to understand ultrafast processes and described it as "femto-photography." It takes around an hour to create enough shots to make a final video, which represents only a fraction of a second of real time. One example of the technology in action showed a pule of light, less than a millimetre long, travelling through a bottle at a rate of half a millimetre per frame. As well as helping scientists to understand light, MIT claims that there could also be practical applications, including use in medical imaging.